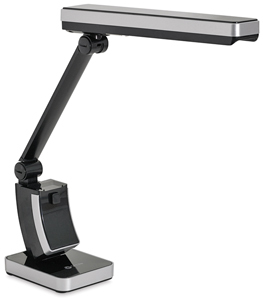 This compact task lamp puts the light where you need it, with OttLite's 508 Illumination that provides a precise balance of contrast and brightness. A healthier way to see, 508 Illumination allows artists, crafters, and readers to view vibrant colors, fine print, and fine details more clearly. It reduces glare and eyestrain, and produces a minimum of heat. What's more, the energy-efficient 13W OttLite HD bulb lasts 10,000 hours — 12 times longer than an incandescent bulb. The sleek, modern design of the SlimLine Task Lamp fits any studio, office, or home décor. The arm adjusts from 14¾"–19¾" (37 cm – 50 cm) high, and the base measures a space-saving 4¾" × 3¾" (12 cm × 9.5 cm). The lamp head measures 12" long (30 cm). 13W Replacement Bulb Type E — The Ottlite 13W Replacement Bulb Type E is made for lamps with an electronic ballast. If you bought your lamp after January 2008 and you find a letter "E" on the current bulb, this replacement bulb should be compatible. If your lamp is older and has a magnetic ballast, you need the Ottlite 13W Replacement Bulb Type A. ® OttLite is a registered trademark.™ 508 Illumination is a trademark.